A poor man’s Peppermint Hogfish, this wrasse does very well but needs a tight lid as it will jump out. 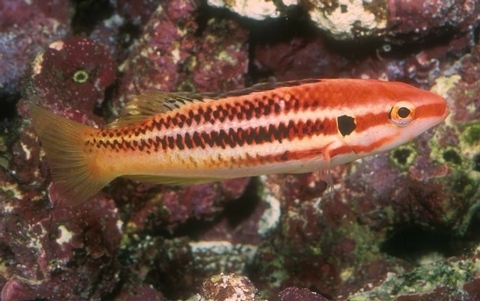 Can be aggressive against others wrasse, either chasing them and taking pieces out of their fins or causing them to jump out of the tank. You need to be careful when mixing them together with other wrasse but most other fish should be fine. Some will attack smaller shrimp and other invertebrates but for the most part they’re reef safe. Not as nicely colored as the Peppermint Hogfish, the Candy Cane Hog’s striping is blended together and doesn’t look as nice. Similar to the Bodianus masudai and Bodianus opercularis.